One of the challenges many men find when it comes to choosing the best nose hair trimmers is distinguishing which is better simply by appearance. Although these little devices do a great job removing nose hairs, they all tend to look alike and make the buying decision that much more challenging. 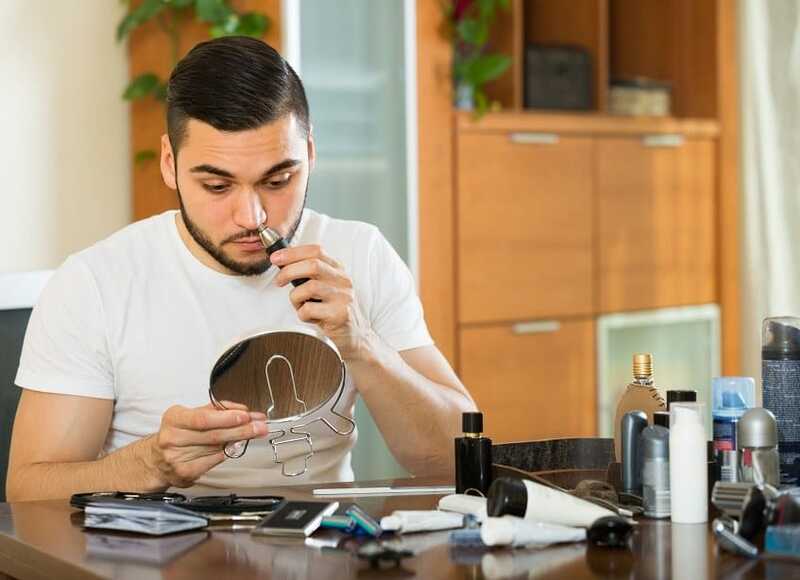 No longer will you have to feel embarrassed about those unsightly nose hairs, this guide is going to dig deep into what separates the best nose hair trimmers from all the rest on the market. This water-resistant trimmer allows you to take care of business right in the shower and then rinse it off to store away for next time. This isn’t your cheap plastic nose trimmer with inferior blades that tug and tear nose hairs, ToiletTree Products has developed a trimmer that is comprised of high-quality steel with a LED light to guide you right to the areas that need trimming. The stainless steel blades offer you a clean, crisp, quick, and smooth cut, a painless solution to your overgrown nose hair problems. You can not go wrong with a product that is backed by a lifetime replacement warranty. One of the reasons this steel nose trimmer is superior to similar products is within a few seconds all those nose hairs in each nostril are trimmed without pulling. Easy to grip and hold in the shower, you should be able to keep your nose hairs trimmed without adding any time to your bathroom maintenance routine. Finally, you can get that accurate and pain-free precision cut when working in the sensitive areas inside the nostrils. Affordable, highly rated and comes with a lifetime warranty, you can’t ask for anything more. The reason the Panasonic ER430K is one of the best nose hair trimmers is because of the design of the cutting blades. This device utilizes a rotary blade cutting system that trims in a circular motion, eliminating tugging and cutting down as far as possible. This unit also comes with a safety cone that will gently guide the nose hairs into the trimmer where the blades will quickly cut them away without any chance of you getting injured. The safety cone also will keep your skin from ever coming in contact with the blades, eliminating the chances of getting cut. Some of the other amazing features of this trimmer are that it runs on one AA battery, steel rotary blades, and a groundbreaking vacuum system that instantly removes any hair clippings. The vortex cleaning system leaves the inside of your nose clear, allowing you to rinse out the trimmer for easy maintenance. The trimmer works in both dry or wet conditions has a sleek ergonomic design for easy handling in any position, and is the perfect weight and size for taking with you in a travel case. 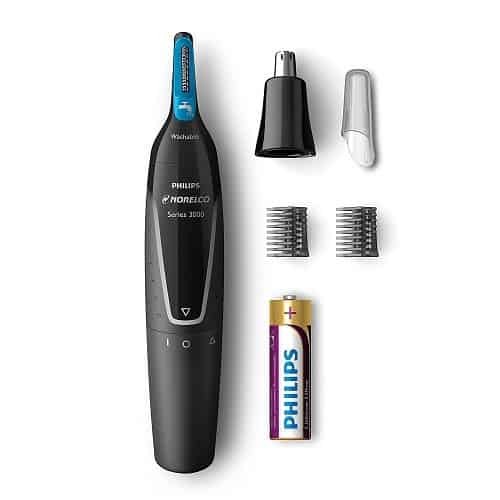 With the advanced trimming system that shields the blades from your skin, Philips Norelco NT3000/49 ear and nose trimmer guarantees that you don’t experience any pulling, nicks and cuts. Besides the rotary precision trimmer, inside the package, you get a dedicated nose trimmer attachment, Lithium AA battery, short and long eyebrow guards and a travel cup. That’s right, you can trim not only your nose and ears with this item but also your eyebrows. This ensures that you evenly trim both short and longer lengths. Lithium AA battery is very powerful and delivers maximum, long-lasting performance. Its lifetime is pretty long, according to a large number of satisfied customers. When the time for cleaning comes, simply rinse the trimmer under the faucet and don’t worry because this product is fully washable and easy cleaned. You can even take it with you while on the go thanks to the travel cup that protects it. 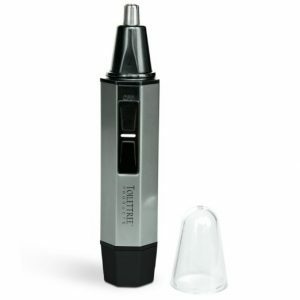 Already mentioned trimming elements which are a dedicated nose trimmer and a skin-friendly precision trimmer are easy to interchange. This can be done by twisting the top attachment counter-clockwise to remove it, then putting the desired attachment and twisting it clockwise to tighten it down. 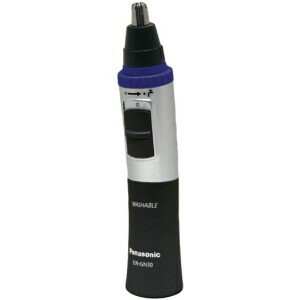 Looking for a sleek nose hair trimmer that has one of the industries leading cleaning systems? The Panasonic ER-GN30-K is the perfect hair trimmer for those who want a close cut without the chance of injury. Rather than plucking or cutting those hairs with scissors, now you can get a super close cut quickly and easily, while the unit cleans itself and is ready for the next time you need a trim. The revolutionary dual cutting system works in both wet or dry conditions, and can easily reach even those hard to see hairs. The trimmer also makes use of a Vortex cleaning system that works by immersing the trimmer in water so the cut hairs can be ejected out while trimming. The ergonomic design makes this trimmer comfortable to hold in any position, allowing you to even work with it while in the shower. Eliminate the chance of cutting yourself and causing a dangerous infection, this trimmer will get the job done and remove nose hairs without coming in contact with your sensitive skin. The best nose hair trimmers on the market do a number of things, they trim hairs easily without tugging, they will not cut your skin, and they are able to work properly in wet or dry conditions. These top-rated trimmers are the perfect choice for the guy who wants to look his best and not spend a considerable amount of time doing so. Photo from: Iakov Filimonov © 123RF.com.